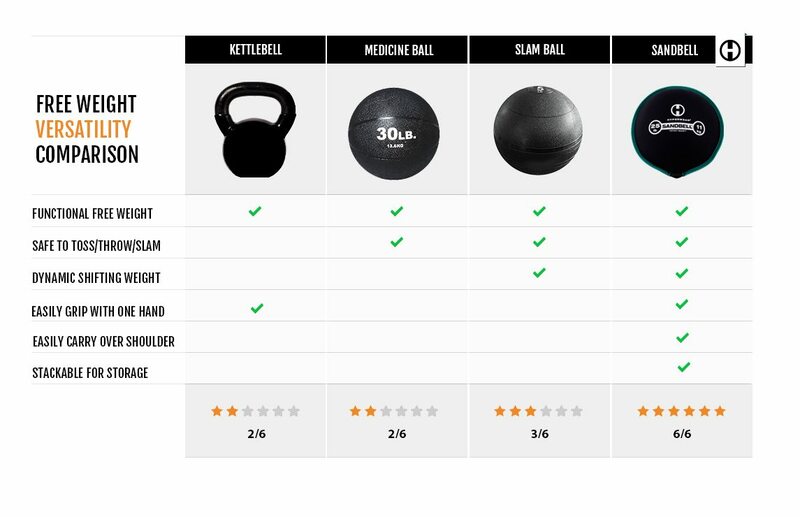 Functional Training Tools: SandBell, KettleBell, Medicine Ball or Slam Ball? A smart athlete, trainer, coach or fitness enthusiast is always looking to do one thing: optimize. Optimize your time spent training, your performance gains, your workout space and your functional training tools. Efficiency is a key ingredient for success when you’re trying to balance sky-high goals with a packed schedule, a limited budget and tight space constraints. That’s why we designed the SandBell® as the world’s most versatile free-weight. 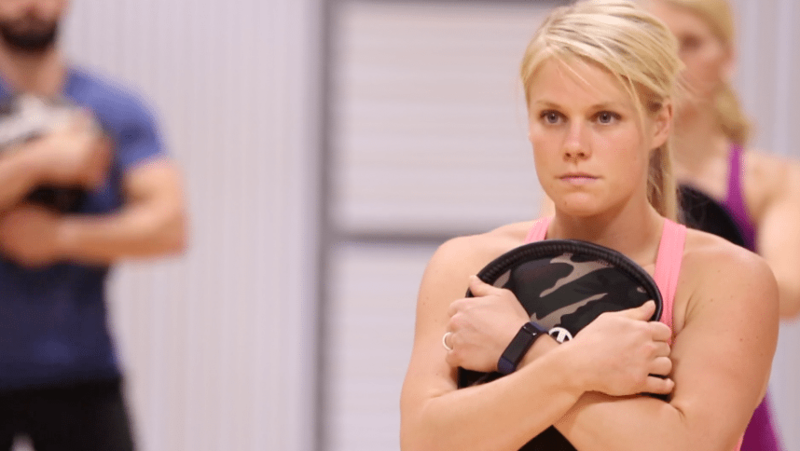 The SandBell combines the dynamic benefits of a sandbag, the power-generating slam-ability of a slam ball, and the single-hand grip-ability of a kettlebell with safety benefits that no other tool can deliver. The SandBell’s dynamically shifting weight increases muscle activation and recruitment so you can spend less time in the gym. Unconventional exercises like the SandBell Slam increase power generation so you see accelerated performance gains. Mixing the SandBell into your sprint training routines or sport-specific drills will build athleticism. And the safe construction of the SandBell won’t damage your floors, so you can work out in any space. All of the products featured above can be considered ‘functional’ training tools. They all allow the user to perform a variety of compound exercises that can build strength, stability, speed, power and endurance. But are they truly ‘functional’? The word functional can be most easily defined as ‘useful.’ So arguably the more uses a tool has the more functional it is. By this measure the SandBell is the most functional training tool on this list. It can be used in ways that the others can’t, and it combines the functions and benefits of the others into one versatile package. Tossing, throwing and slamming exercises all require huge power generation. They also build explosive strength and will fire up your metabolism for increased caloric burn. This makes them highly effective for people of all fitness levels. The medicine ball, slam ball and SandBell are all functional training tools that allow the user to perform these types of exercises. But partner drills using a hard rubber medicine ball or slam ball can go horribly wrong if one person is not paying attention. The SandBell, with its soft neoprene exterior and flexible sand filling, eliminates this concern. A kettlebell or medicine ball can deliver a great workout. But because they are solid objects that remain in one shape with the weight evenly distributed, they don’t offer the same challenge that a SandBell does. The SandBell creates a more dynamic condition for the user as the weight within shifts during use. This “live weight” not only hits the targeted muscles, but also requires greater engagement of the core to maintain stability and balance. The SandBell also requires you to grip it differently than other functional training tools, which adds a greater challenge to the fingers, hand, wrist and forearm, and results in deeper muscle activation overall with every move. You can use the SandBell to perform a huge variety of exercises that a medicine ball and slam ball cannot deliver. Just like a kettlebell, you can hold a SandBell in either one or two hands, which allows you to easily load one side of the body and dynamically switch the weight from side to side. However, unlike the solid kettlebell handle, the sand-filled flexible neoprene exterior of the SandBell is constantly shifting and changing. This makes it superior for effectively building grip strength. Grip strength is a vital part of everyday life that most take for granted. From turning a doorknob to carrying groceries, deadlifting a barbell to holding the handles on your spin bike, we all depend heavily on good grip strength. Without adequate grip strength, we would be rendered practically useless. The SandBell’s flexible exterior also means it can mold to different shapes, making it much more comfortable to carry. Throw a SandBell over your shoulder for sprint intervals or hill runs. Bear-hug the SandBell to your chest for squats. Place it across your shoulders for weighted push ups. Or rest it on your legs for bench dips. It won’t dig into you, cause extreme discomfort, or roll away like other functional training tools will. The SandBell’s disc shape makes it incredibly easy to store. Stack multiple SandBells on top of each other, without worrying about them falling and rolling all over the place. The SandBell maximizes your storage space with a minimal footprint and without sacrificing functionality, so you can truly optimize your training space.